Sure, snakes probably aren't the first creatures who come to mind when thinking about cute animals - but this tiny newborn still might just slither her way into your heart (metaphorically speaking, of course). Meet the newest arrival at the Australian Reptile Park: this very wee King brown snake. 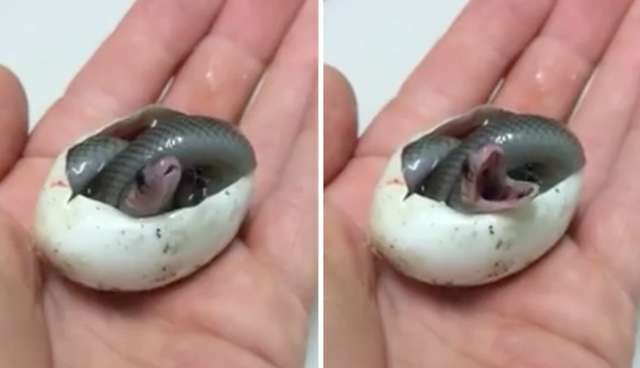 Just try not to gush at seeing the scaly baby begin to hatch from her egg, entering the world with what appears to be one of the heartiest little yawns ever caught on film. Now, before you run off to cuddle one of these suddenly lovable-seeming reptiles, it should be noted that King brown snakes produce highly toxic venom and aren't afraid to use it on humans who get too close. But hey, at least their baby yawning is cute.